NES Super Mario Bros. (JPN/USA) "warps, walkathon" in 06:53.52 by HappyLee. 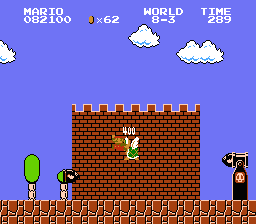 Contrary to common belief, Super Mario Bros can be completed without pressing B at all. This is a sidestroller, speedwalk, or whatever you want to call it. This is about a half-second faster than the previous movie by the same author. June 16,2008: .avi replaced. Previous .avi was of the wrong movie. Redownloading is needed.